Aim: This was to assess if Dutch dentists have comparable attitudes in providing diagnosis and consecutive dental treatment in children. Prevention, radiographic diagnostics and restorative care were compared in four consecutive age groups [<6 years old, 6–8, 9–11, 12–17]. Methods: In a cross-sectional study calculations were made using the financial records of one of the largest Dutch health insurance companies. After Medical Ethics approval all dental records of 4,500 dentists over a period of three consecutive years were used to calculate correlations and odds ratios, using early treatment, oral diagnosis, preventive approach and the use of local analgesia as basic independent variables. Results: Early diagnosis based on the use of radiographs in children younger than 6 years increased the likelihood of direct restorative care 2.8 times and the likelihood of restorative care in future age groups 2.2, 2.0 and 1.6 times respectively. Early radiographs increased the likelihood of diagnostics in consecutive older groups by 3.7, 3.4 and 1.9 times respectively. 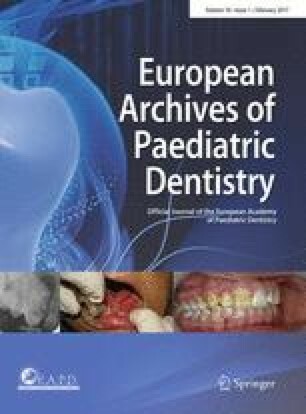 Conclusion: An early diagnostic approach based on radiographs in paediatric dental care seems to be indicative for dentists’ pattern of dealing with older children. This child-centred approach is limited to a small number of dentists.